Knocknarea Arena in IT Sligo played host to a One Day seminar on Satudrday 27th of November 2010. The course was given by Aikikai Ireland instructors Trevor Pigott Sensei and Eamon Coyne Sensei. We then celebrated afterwards with our Christmas party, thankfully there was no camera present at that 8). But Declan did get some shots of the some of the action during the day, one of which is a lovely shot of Mark Connell and Eamonn Thompson above. For more shots from the course just click the link below. We have updated the Photo gallery with some shots that were taken at the great Slovakian Aikido Summer camp with Michele Quaranta Sensei in Radava. Plenty of great training, eating, drinking and sunshine. Also included are some shots of the gangs trip to Vienna afterwards. To view the photos just follow the link below. It was with regret and concern that we received the sad news from Michele Quaranta Sensei that he would not make the October course in Athboy as both Michele Sensei and the Aikikai Ireland students had eagerly anticipated. However with quick thinking and reorganising Michele had asked if it was ok that Joe McHugh Sensei be willing to fulfil the duties and give the course in his place. Aikikai Ireland has the pleasure of announcing the opening of a new dojo in Tallaght by Norbert Toth Shodan Aikikai. The Aikido Ikeda Dojo Dublin is located in St. Mark's Community School, Tallaght, Dublin with class on every Tuesday from 6pm to 7.30pm. 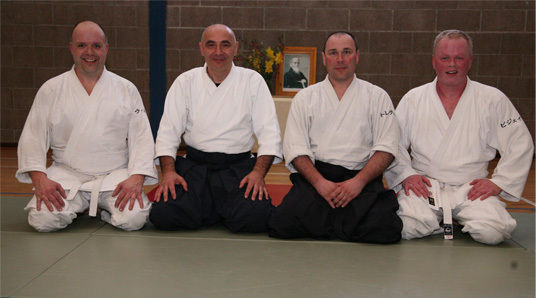 Nobert Sensei has many years Aikido experience both at home in Slovakia and also now here in Ireland. Everyone involved with Aikikai Ireland would like to wish Norbert the very best of luck in his new dojo. 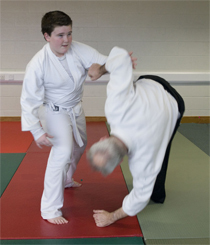 For further details follow the link below to go to the Aikido Ikeda Dojo Dublin homepage. We have all been so busy training at our dojo's, at courses both here and abroad our 1st Birthday almost slipped by unnoticed. 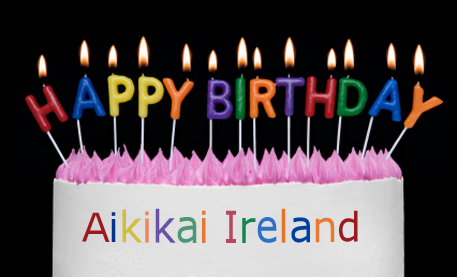 On Tuesday 2nd June 2009 Aikikai Ireland was formed. Since Aikikai Ireland's inception over 1 year ago all of the people involved have strived to make it happen, and the fruits of everyone's labour have been fantastic. In the past 12 months alone Aikikai Ireland has hosted 7 seminars with visiting instructors namely Michele Quaranta Sensei, Fiordineve Cozzi Sensei and Paul Linden Sensei coming to teach the lucky Aikidoka that had the pleasure of attending these highly qualified instructors. In addition to hosting visiting international instructors Aikikai Irelands very own instructors have been busy giving multi instructor courses that were well attended and supported by each of the dojo's students. Well done to all of the Aikikai Ireland members we should be proud of our achievements so far, let's keep going onwards and upwards. On the 11th through to the 13th of June the Sligo dojo hosted Fiordineve Cozzi Sensei 5th Dan Aikikai for a very enjoyable Aikido seminar. The course was a great success with participants attending from all 6 of the Aikikai Ireland dojos. A big thank you to Fiordineve Sensei from Aikikai Ireland for giving another great weekends training and also to the traveling Italian Aikido students for coming to practice with us. Click the link below for course report and course photos. On Saturday the 29th of May, the Sligo Dojo hosted a one day seminar. The course also offered students the ability to grade with grading's sessions held at the end of the days training. You can now follow Aikikai Ireland on Facebook. The group was kindly set up by Kevin Finn the Aikikai Ireland Public Relations Officer. For those of you that are on Facebook spread the good word 8).You can also add clubs that are set up on Facebook through the Aikikai Ireland group page too. 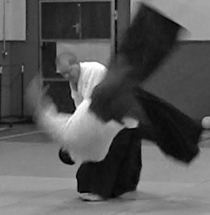 To see the Aikikai Ireland Facebook page please click the link below. The course that was held in Athboy given by Fiordineve Cozzi Sensei 5th Dan Aikikai in March has appeared in an Italian Newspaper last week. 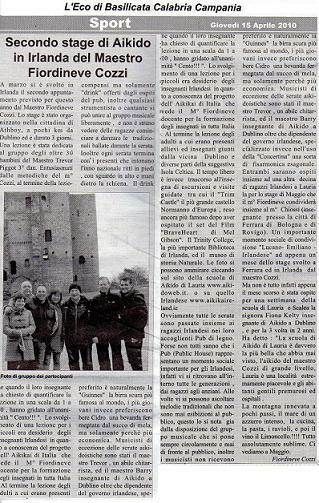 The article was written by Fiordineve Cozzi Sensei and was published in the Eco di Basilicata newspaper on the 15th of April 2010. 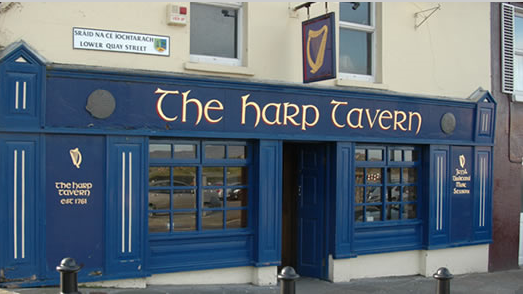 In the article Cozzi Sensei describes his visit to Athboy and the excursions that he went on and also the evening entertainment that he sampled on his trip. You can read the article which is available in both Italian and English by clicking on the link below. Pictured above are the newly promoted Shodans Will Baker and PJ Kirke after passing their test at the Aikikai Ireland Spring Course with Michele Quaranta Sensei also in the shot is the lads very own instructor Trevor Pigott Sensei. Well Done Will and PJ!!!!! For a detailed report of the thoroughly enjoyable course and course photos follow the link(s) below. Sligo Aikido Club members Declan Bray, Paul Burns, Loretta Coyne and Eamon Coyne completed the Carney 10 Kilometer run in aid of the Sligo Aikido Club on Monday 5th April 2010. The race was well attended with over 250 people participating on what were very tough conditions. All club members were very happy to have completed the race and raise funds for the club. 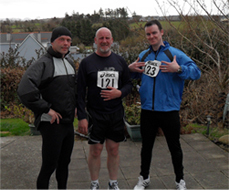 A special mention has to be made for Declan and Paul who managed to complete the event in the Veterans section...... Joking aside well done to all, you done yourselves and the dojo proud. 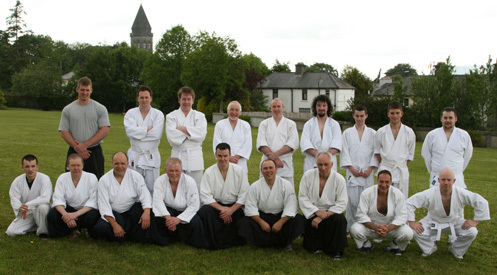 On March 12th through to 14th Athboy played host to Fiordineve Cozzi Sensei. The course was enjoyable as always with Cozzi Sensei covering a multitude over the weekend. A table Quiz was held on Thursday 25th February 2010 in the Harp Tavern in aid of fund raising to purchase tatami for the Sligo Aikido Club. The quiz was a great success with well over a 100 people turning up on the night.